sailboat. 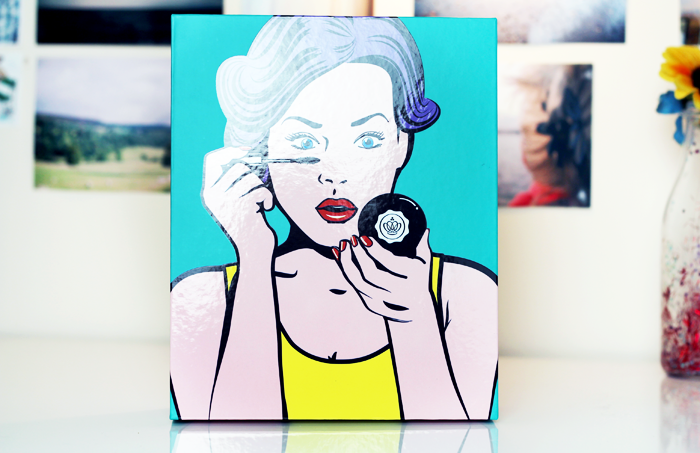 : October Glossybox | Pop Art Collector's Edition. 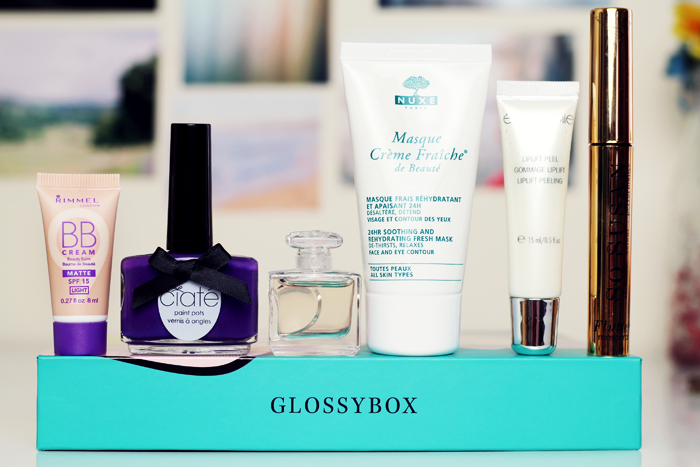 So, this month's Glossybox is undoubtedly eye catching. If you love pop art or just bright colours in general, I imagine that this will be a box you won't want to throw straight in the recycling immediately after opening. I've recently kicked the habit of holding on to every pretty pink box. They were beginning to take over my entire house and it turns out that I don't own enough little things to use them all for storage. However I might just have to try and find a use for this one, or at least save it to pass on to someone else. The contents don't feel quite as impressive as the box itself, but that's not to say there aren't some good things in there because there are - 4 are full sized! I'm not sure if they were ever supposed to fit with the pop art theme, but I feel it's maybe a bit of a missed opportunity. They could have gone all out and made it really fun, even some multi-coloured tissue paper inside would have made a nice change from the regular pink & black. I don't know, maybe I'm just becoming increasingly picky as I get older, or maybe I was expecting too much. The Rimmel BB Cream is much too dark for me, but I already know who I'll be passing it over to and the formula feels really nice. I liked the Yves Rocher perfume at first, but the scent it dries down to is a little too overwhelming for me but again, I know someone who will really like it. 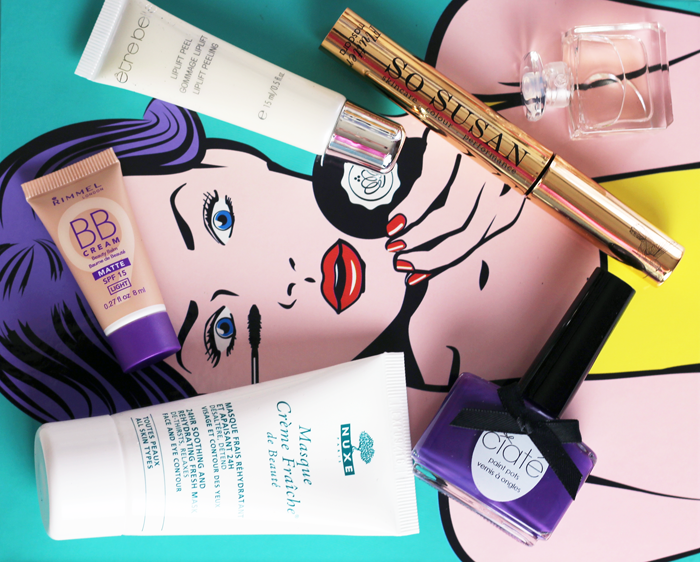 The So Susan mascara is something I've tried before and bizarrely it refuses dry on my lashes. It also has a tendency to explode out of the top of the tube if you push the wand in too quickly, which is something to watch out for. But I've also read some rave reviews, so it just goes to show how personal make up can be. The Ciaté nail polish is a fabulous purple shade that feels very Halloween appropriate! I've never tried a lip scrub before so the Liplift Peel is quite intriguing and I'll be interested to see if I like it more than just using a toothbrush on my lips if they're looking a little worse for wear. The stand out product for me is the Nuxe Mask. Anything promising to soothe and hydrate in the colder months is worth a try and I like that it's one that doesn't have to be removed because in my experience, the ones you can massage in completely tend to be the ones I prefer. What do you think of this month's offerings? Wow, this is a gorgeous box, definitely one to keep! The Ciate shade is beautiful as well - what a shame that the BB cream is too dark. That Ciate polish looks a gorgeous colour! First off, LOVE the design on the box!! 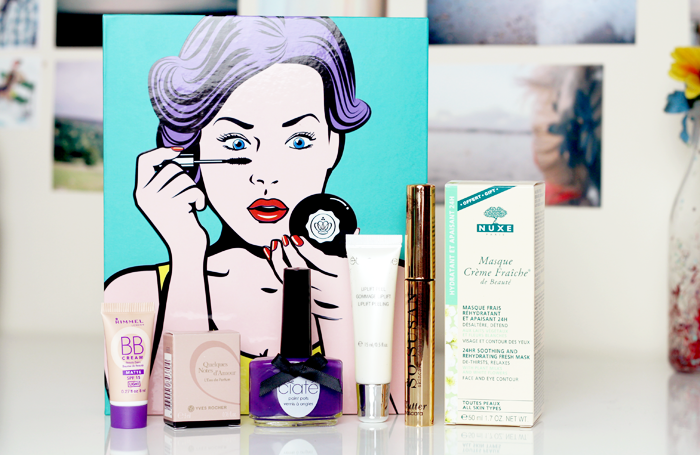 The products look pretty good this month, a few things I'd be intrigued to try. Love the shade of that polish too. I do love a bit of pop art so the box is tempting! The box design is beautiful! I LOVE the look of the purple nail polish, purple is my favourite colour and that will definitely look gorgeous for autumn! ahhh how i've missed your blog!! love the new layout! The box itself is so cool! It's a shame that not all of the products are for you, that's why I'm so reluctant to subscribe to a beauty box.. I really wanted to give the Rimmel BB creams a go, other than the colour do you think it'd be worth buying the actual product? And the nail varnish colour is gorgeous! Oh wow love the box!! This box looks so cool! What awesome art! I was about to warn you when I saw the So Susan Mascara but you already know! It's literally the worst mascara I've ever used such a nightmare haha. Otherwise the contents look really good I love the nail polish shade! That ciate polish is gorgeous! Oooh, that polish colour is SO pretty. I can almost never wear nail polish but I'm so tempted to get it! The box itself is so pretty!!!! It looks like a really nice box this month! & the box itself is amazing looking! Don't think I'll be trying that mascara, but the packaging is so similar to YSL's! The packaging on the box is so cool!